Usually in Business organizations and especially in organizations where R&D is a separate department itself a tension persists on keeping the IT department away from any decision when it comes to innovation or process improvement. 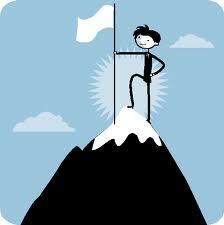 In short the IT department is generally seen as less of a help and more of a hindrance to innovation efforts. One of the main reasons is traditionally information systems are designed to impose structure on process, achieve pre-defined goals, produce metrics and minimize need for human interaction (in some case over maximize human interaction leading to nothing but "meetings"). While Innovation activities are highly unstructured and emergent, IT cannot be ignored or kept in isolation because IT can help in visualization tools, data mining efforts, uncover hidden relationships between data and create tools of knowledge management/information repository that so desperately is needed cross functionally but especially by the innovators within a organization. An organization that integrates IT and the innovation department to make Innovation 'IT enabled' brings a different level of empowerment to the organization. Components of a IT enabled innovation department for a business organization consists of three components. 1) IT-enabled organization capabilities: This relates to combining IT assets (data, infrastructure and expertise) with non IT-assets (such as creativity of innovators, technological sophistication of top management, ote enable the across-the-board business processes essential to developing and applying innovations. 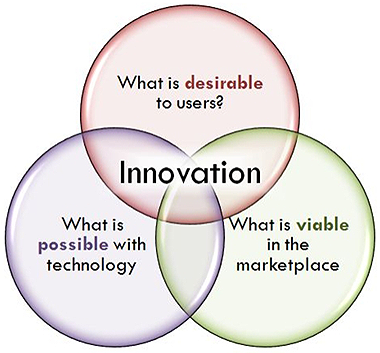 2) Secondly organizations need a strong set of IT-based tools to effectively sustain the central activities required for innovation and to support the analytical & statistical work that scientists, business innovators, engineers and designers need to transform ideas into products, processes or services. 3) Finally organizations need a system of "Control" that allows innovation workers to access and use the IT resources effectively and follow a framework that is standardized as well as in some cases is flexible. Some ways to bridge this gap is bringing IT specialists on board the R&D or process improvement teams and innovation meetings, another way is make IT specialists responsible for innovation-success metrics. For example firms like Du Pont and Archers & Daniels have their R&D department regularly interface with IT on tools they want to procure with a variance report from the organizational standard of Tools pool. IT then takes the requirement, analyzes the variance but is ever careful not to step on R&D effort to contribution and makes the approval process a collaborative effort. Interestingly these organizations have a VP of Innovation and on the organizational chart VP of innovation has a dotted-line reporting from the CIO. My observations after reading lots and lots of case studies in varied industries in most cases - is an absence of innovation-facilitating IT governance practices a reason at the root of the problem. In practice some organizations put significant IT resources in the hands of business innovators or R&D, in some there is no IT resources allocated, in some it is shared resource working in isolation. It is here that IT Governance becomes of paramount importance in getting technology to be partnering innovator in the innovation process. The idea here is the specific mode of control (Governance) is not as important as its capability to facilitate routines and policies for addressing innovator's requirements and meeting those requirements for the overall benefit of the organization and its customers. Devising a CRM business strategy is unrealistic without a proper understanding of the benefits and opportunities of enabling technology and vice versa. In a recent survey Gartner group reports that CRM project have the highest failure rates in implementation but have the highest potential in terms of return on investment rates. I want to talk about a study done by Peter Lin and Anne-Marie Corteau & myself which I find very relevant to find what are the critical success factors that are significant of CRM Technology initiatives. The study surprisingly revealed what should be apparently significant CRM impact for an organization is not that significant as perceived by many. 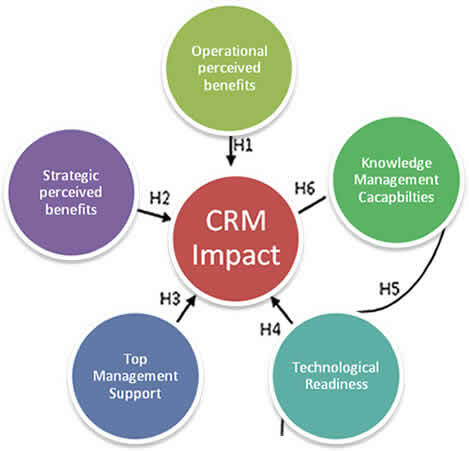 The direct CRM impact as perceived by many are operational and strategic benefits arising out of CRM technological initiatives. Operational perceived benefits such as front-office efficiency and productivity in sales, marketing and customer support and service functional units to shorten sales cycle, marketing cycle, and customer support due to better employee productivity. Furthermore improved operational productivity means decrease in costs. On the other hand the perceived strategic benefits would be defined as the the tactical, opportunistic and competitive advantage a CRM implementation can bring in terms of churning of information into useful strategic knowledge base. The hypothesis were to calucate the significance (postiviely or -vely linked) of each factor contributing the CRM impact of technology on overall organizational effectiveness. Internal and external focus of the CRM impact were summed to see the overall effectiveness. A component based software package developed by Chin and Fee (1995) was used to assess the measurment model and the structural model with confirmatory factor analysis technique. The PLS (partial least squares) statistical method was used for the analysis of latent vairable structural models involing multiple constructs with multiple indicators. PLS is a second generation multivariate statistical technique that allows the test of pschometric properties of scales us to measure different variables. With the structural equation modeling technique, the construct reliablity is mot most commonly calculated using rho (ρ) coefficient, a coefficient of reliabiltiy that measures how well a set of items measures a single latent construct. The results were surprising H1 was not supported as there was a -ve and non-signification relationship between operational perceived benefits and cRM impact (path coefficient =-0.123, p>0.05), H2 is not supported as the strategice benefits perceived and CRM impact though positive was not yet significant as (path coefficient = 0.065, p>0.05), H3 is supported since the relationship between top management endorsing and supporting CRM impact resulted positive and significant (path coefficient 0.255, p<0.05. H4 is not supported since the link between technological readiness and CRM impact is positive but yet nonsignificatn (path coefficent = 0.062, P>0.05). H5 is supported since the relationship between technological readiness and knowledge management capabitilities is positive and significant (path coefficient = 0.0631, p<0.001). H6 is also supported since the relationship between knowledge management capabilities and CRM impact is positive and significant (path coefficent = 0.486, p<0.01). The proposed research model appeared to provide good power to explain 43.0% of the variance in CRM impact. Interestingly the organizations surveyed were from a diverse spectrum (pharmacy, healthcare, technology, etc), and it was surprising to see that what perceived to be prime motivators for spending in CRM implementation did not turn out to have significant CRM impact whereas CSF's turned out to be technology readingess, knowledge management and top-tier support. Break From Governance Posts...the iPAD cases that I like! iWell I decided to take a break from the Governance posts but not for long, just to put interesting stuff up here, I want to share two iPAD cases that I love...sorry like...like and so far the only two that have impressed me are Twelvesouth's BookBook & Dodocase. There are thousands out there but these two give a good old book feel. This one really looks like you are helping the cause of antique or collector books but you are secretly hiding a iPAD. This is the same company that makes the well known BookArc for the macbook pro and the iPad. If you want a good leather folio moleskin look that is sturdy and good looking even when it stands this one's for you. Both cases are leather and look really cool. They are priced at $69.99 and $59.95. The price though little steep is worth it for its very clean and classic looks. 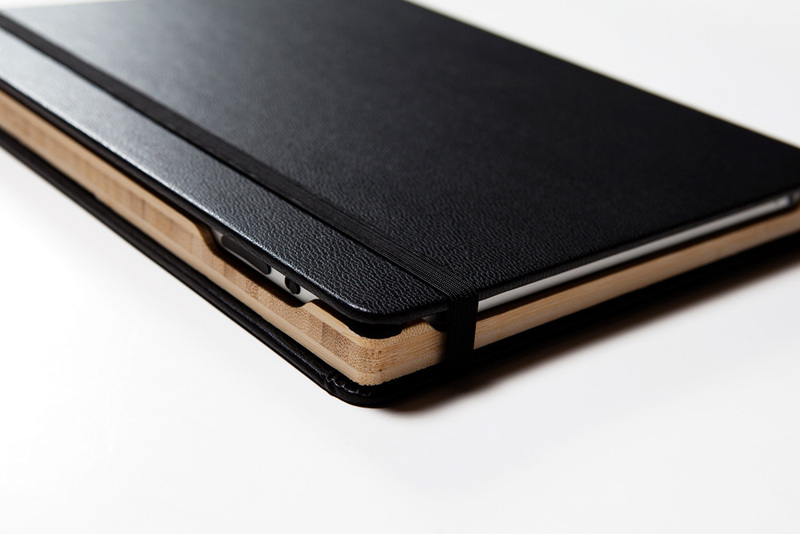 The one advantage with the dodocase is the wood casing inside. Makes it a little bit sturdier when it stands, just a point I thought that made it a better choice between the two but all five stars for both in looks. Tweet which one you like of the top two? Let me know. Accountability & Strategic Accountability: The executive leadership has a clear mandate to drive data governance process. This means roles and responsibilities for various people in the organization that are involved in the data governance process be accurately defined. Standards: Data standards needs to be established. Corporate Data is a valuable asset that needs caring & defining which means it made for a purpose and that purpose determines and drives value. Embracing Complexity: Data stakeholders are the producers and consumers of data hence the data stakeholder management is a complex process as data itself. Processes need to be implemented taht collects, churns and distributes this data to the right stakeholders. Choosing Strategic points of control: Controls need to be put in place to determine where and when the quality of data is to be assessed and addressed. Compliance monitoring: Data management policies and procedures need to be assessed periodically in order to ensure that the policies and procedures are being followed. Metrics: Definition of outcome specific data quality metrics is important for measuring data governance success. Training & Awareness: Data stakeholders need to be aware of the value of data governance. The importance of data quality, its benefits, values need to be communicated regularly. I added the last two in the list because from the political and perception standpoint these points are considered lightly and eventually become primary reasons for the failure of implementation of Data Governance in organizations. From personal experience I have seen small as well as big organizations becoming comfortable on the last two points during the implementation of a data governance framework. 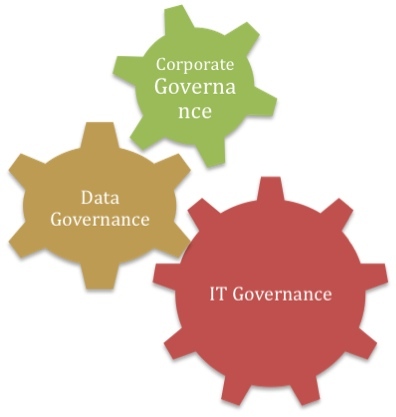 Should IT or business drive the data governance programs in an organization? This opens a can of worms and possible debates in the academic and the industry. Practice in various types of organizations/industries be it in regard to IT Governance or Data Governance differs exponentially. In most of the cases its absent, in some their is no differentiation as it is lumped as something the technology department does, in some organizations there are clear distinctions between corporate governance vs IT vs Data governance whilst in some each operate in isolation. The COBIT framework incorporate financial reporting component from the COSO framework which implies that data quality is critical and important for preparing accurate financial reporting. The CEO's and CFO's are personally accountable for the credibility of these financial reports (thx Sarbanes-Oxely Act of 2002). Therefore inherently it is the direct responsibility of the the Business functions to ensure the correctness, credibility, quality and validity of the data and IT is responsible for the infrastructure that holds, processes, data-mines and reports on that data. 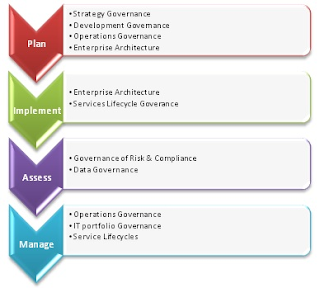 Here then lies our answers to the difference in IT Governance and Data Governance. IT Governance ensures that the IT infrastructure aligns with business objectives and utilizes cost effective measures to integrate technology with business functions. It thus becomes the pipe that connects flow of information for business heads to take decisions on. Whereas Data Governance is as Cohen(2006) defines "the process by which a company manages the quantity, consistency, usability, security and availability of data". I like the way Thomas G (2006) in her book 'Alpha Males and Data Disaster' defines data governance as the referring to the organizational bodies, rules, decisions rights, and accountabilities of people and information systems as the perform information-related processes. She appropriately puts it well saying "data governance sets the rules of engagement that management will follow as the organization uses data". 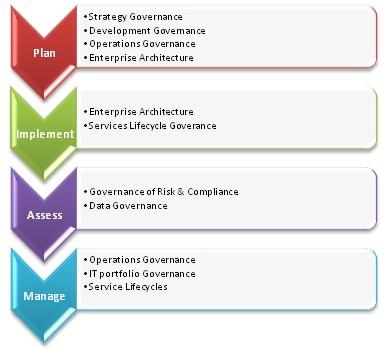 So it may be very confusing if Data Governance is sub-set of IT Governance? True and False, in some cases it is parallel in some cases it may fall under IT Governance function but primarily Data Governance is a management responsibility. The way I see it is Data Governance and IT Governance and overall Corporate Governance as smooth aligned gears rotating their processes & functions under a specified framework of exchanging information & reporting to fulfill the corporate governance objectives of the management. This in turns helps in adding value and better alignment/integration of technology, data and business functions. Thoughts @ night on the reasons why the CIO is not just the bridge but a data streaming coaxial cable between business and technology. 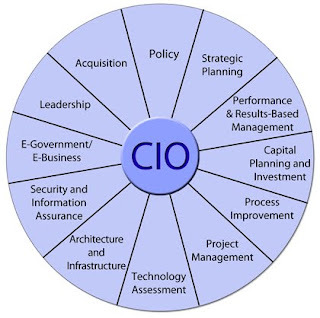 I feel IT Governance is the most an important function under the umbrella of the CIO. Since Technology Governance is a overarching organizational issue, the CIO comes in as a strategist with the unique ability to bridge the gap of the many business departments and that require technology and offer perspectives on solving business problems. In practice however there seems to be a lot of confusion in roles and responsiblities of a CIO in the technology governance realm when compared to the CTO. The CIO is not your IT guy, web guy, or the techie that rescues you from the hole. Big picture thinking is the ability to see the whole gammut of organizational operations and see, identify the broken processes or the lack of them and the need of integrating technology to improve efficienty of the bottom line of operations and streamline flow of information back to the senior management. 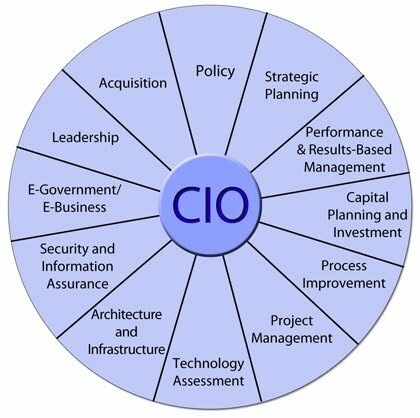 A CIO role in technology governance becomes crucial because he is responsible for connecting the dots of communication between business functions internally and use a heavy dosage of business intelligence and market awareness and bring that data to the table for strategic planning and strategic decision making. Another key area I feel the CIO role in IT Governance is auditing risk and security of the databases, data in general, and the procurment & implementation of the technology strategies. A cost/benefit ratio analysis, ROI and other financial ratios and KPIs are important tools in the arsenal the CIO carries. But I thought the CIO was the head of the IT department? The technology department is a operational entity but also a curcial strategic entity these days. Because of its operational nautre and its 60% responsibilities take the nature of executing and supporting daily technical needs of employees, implementing technology, building services etc, it still requires the guidance of the CIO to implement and make sure that these activities aim at increasing efficiency of the organization and satisfying current and future business needs & problems. In many organizations based upon size there may be multiple operational IT managers and here is where alignment of solutions and operational efficieny and mitigation of risks should go hand in hand. Why don’t other departments just talk to the operational manager(s) of IT? Normally the technology department or operational project managers take in problems, build a new service from heads & personnel of functional depts like HR, Finance, Engineering, Warehouse etc and implement solutions in silos, or "one-off" solutions that are temporary fixes, workarounds because of costing issues. But these end up being expensive in the long run because of maintenance burdens, migration bottlenecks, and ultimately wastage of IT Resources. The role of the CIO becomes crucial here because he takes into account alignment of business needs, overarching business goals, future needs, and plans for scalabiltiy. These factors bring in skill sets the CIO offers to be the middle man broker between functional heads and technology. The final objective is seamless integration for seamless delivery of services using technology. A CIO's involvement thus in Technology Governance becomes less in operational & technology implementation but more involved in business strategy, revenue generation, business-technology process management, and being the completing cog in the entire customer relationship management. My intention here of using CRM term is intended at internal as well external customers and this includes all the partners who are involved in increasing the value chain. CIO's involvment is heavy in terms of strategy, critical data touch-points and information risk management. So to start off, What is IT Governance? All these ensure that the organization's information technology and technology in general sustains and extends the organizations's strategies and objectives. The traditional roles of IT being support function is disappearing as technology becomes vital component in the delivery of services and products but at the same time technology is also the component that keeps running the systems and processes of the organization. Hence the role of the CIO's and IT Director's is thus becoming more than technology experts but have the inherent need to understand business and its reach so as to marry the two for effective partnership to deliver the objectives of the senior management. The ideal candidates for Governance position have to have the unique ability to add value to the overall services & offerings of the business, assess & mitigate risks, and be involved in the optimization of business processes through the use of cost effective technology solutions. Having known this what is the role of the executive management? 1. Comply with corporate governance recommendations. 5. 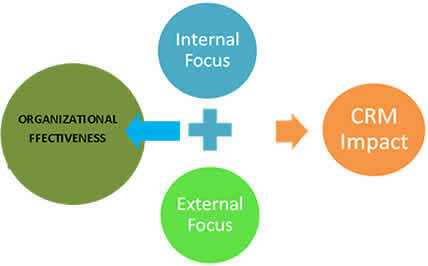 Focus on Technology alignment to business, partners, delivery of services and the management of risk. 6. Finally Measure performance in building capability and achieve goals.